The Pottery Place Warehouse is your one-stop-shopping choice for outdoor landscaping products, and we have the most diverse and eclectic collection of birdbaths and water fountains in a variety of styles. Our brand new location boasts 8,000 square feet of indoor space and two acres of outdoor space, where you are free to roam in your quest to find the perfect accent to your home or redecorating project. We invite you to browse until your heart’s content, and we guarantee you’ll find surprises around every turn. Because we buy our birdbaths and fountains direct from the artisans that make them, we are able to pass on the savings to our customers. Why buy generic, mass-produced outdoor decor when you can find something unique and original in our showroom? Let your imagination run wild as you wander through our offerings, finding the perfect expression for your unique personality. Come find the birdbath or fountain that’s right for you at our new location on Grand Avenue. 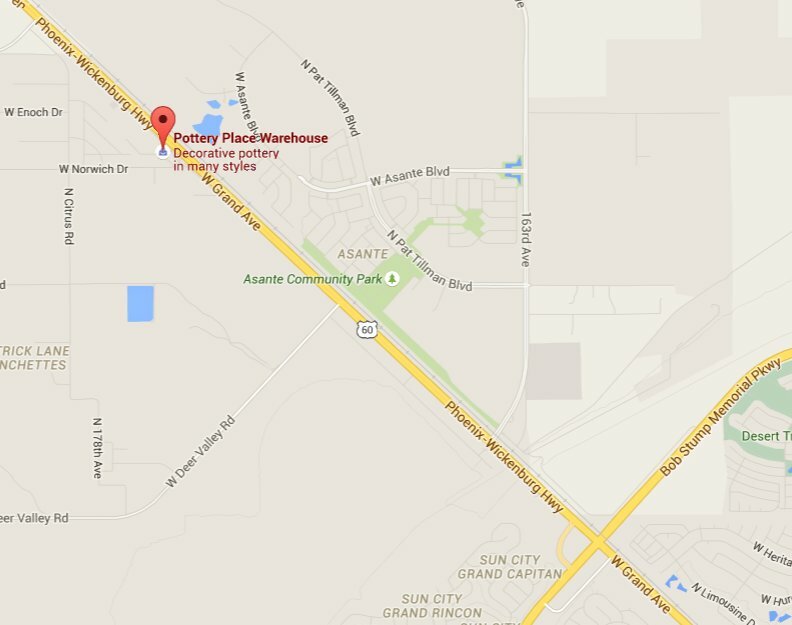 You can click here for directions to The Pottery Place Warehouse, or give us a call at (623) 214-9080, to find out if we have what you’re looking for in stock. When you shop with us, it’s a good idea to plan on staying for a while because you’ll find one pleasant surprise after another for your Phoenix, AZ home. A fountain is more than just another part of your landscape – It’s a focal piece of your garden, patio, or poolside that offers you and your guests a peaceful blend of soothing sight and calming sound. Fountains are alive, and with our wide selection of handcrafted merchandise, you can find one that real dimension to your outdoor living space. Whether you’re looking for something small and simple, colorful and ornate, or large and awe-inspiring, we have a fountain that will suit your tastes. With offerings suitable for contemporary Phoenix homes, and homes decorated with a Spanish Colonial, Southwestern, or Tuscan theme, you will likely have little trouble finding the right fountain. You don’t have to be a bird enthusiast to enjoy the beauty of a birdbath, but it sure doesn’t hurt. Our birdbaths come in all manner of styles, designs, colors, and sizes and, when coupled with your existing bird houses and hummingbird feeders, can draw countless species of native and migratory birds to your backyard. Sometimes a birdbath is simply a decorative piece meant to provide a focal point for your outdoor space. Our many concrete and tiled creations are unique – not the drab and poorly made cookie-cutter products you see in the outdoor sections of the major department stores. Best of all, we are able to keep our prices low because we but direct from birdbath artisans, essentially cutting out the middle man. If you are into birding, there are many species that are more likely to visit your backyard feeders if they are enticed by the shimmering waters of a birdbath. Even in densely populated parts of Phoenix, backyard birders with birdbaths commonly see sparrows, starlings, towhees, doves, kinglets, mockingbirds, finches, and verdin, which are barely larger than a hummingbird. Your Arizona backyard should be your oasis, and there is no better way to attract life than to feature a birdbath next to your patio or pool. Turning your house into a home takes time, but adding the right features helps you settle in and feel comfortable. The birds and animals you come to know over time add to this experience, and water features are the best way to bring them to your backyard. We are eager for you to check out our new location, because since 1998 we’ve been helping Phoenix, AZ residents find the perfect pieces of indoor and outdoor decor.